It is the Dublin-based company's 29th outlet since it launched in 2010 and will stock the very latest TaylorMade M6 and Callaway Rogue product. The Clubs to Hire website is already able to take bookings and sets of clubs will be available from March 1. The Porto region features some outstanding venues, such as the five-star Vidago Palace, the links at Estela, and Oporto, Portugal's oldest golf course. It is growing in popularity as a golf break destination and the opening of Clubs to Hire will make playing in the region a whole lot easier for golfers. Clubs to Hire co-founder Tony Judge said: "Porto is a wonderful region for many reasons and its golf offering has really been underappreciated. We're delighted to be able to open our 29th outlet in Porto at the start of what we feel will be a very busy year for Clubs to Hire. 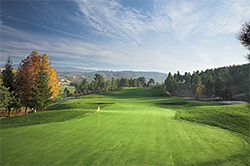 It certainly won't be our only new outlet in 2019..."
Clubs to Hire handles more than 300,000 annual visits to its website and more than 80,000 bookings for rental clubs at 29 locations worldwide, including popular golfing regions in the USA, Thailand, Australia, South Africa and five countries across the Mediterranean, offering the latest clubs on the market, from leading brands such as TaylorMade, Callaway and Mizuno - for men and women, left- or right-handed - from just €35 per week, a potential saving of up to €193, with none of the hassle. • Founded in 2010 by Irish entrepreneurs Tony Judge and Gerry McKernan, Clubs to Hire opened its first branch at Faro airport, in Portugal, the same year, offering rental sets of the very latest golf clubs, from just €35 per week. - Ryanair - maximum £65 each way. High-resolution images of Clubs to Hire outlets, personnel and TaylorMade M6 metal woods may be downloaded from here.